Question: What happens when Alka Seltzer is mixed with vegetable oil, water and food coloring? 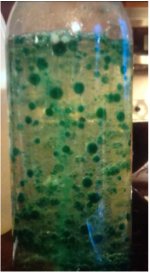 Hypothesis: Our hypothesis is that when we drop the alka seltzer in the mixture of vegetable oil, water and food coloring that it will create a bunch of blobs and look like a lava lamp. ​1: Pour 3/4 cup of water into a bottle using a funnel. 2: Full the rest of the bottle up with vegetable oil then wait for the two liquids to separate. 3: Once the water and oil have separated add 8-10 drops of liquid food coloring (any color) into the bottle. 4: Then put 1 or 2 tablets of alka seltzer into the bottle. After you drop the tablet in you can decide whether or not to put the lid on the bottle. 2: Do not let the mixture overflow. 3: Use the right amount of each ingredient. 4: Do not use gel food coloring. 5: Do not touch your eyes after touching mixture. 1: Don't shake the mixture before or after adding the alka seltzer. 2: Don't put to much vegetable oil or water in the mixture. 3: Don't put over 10 drops of food coloring in the mixture. 4: Do let the water and oil separate before adding food coloring. 5: Do wash hands after touching mixture. Why don't the oil and water mix? The oil and the water don't mix because the oil is light than the water. The oil and the water don't mix because of something called "intermolecular polarity" . Molecular polarity means that water molecules are attracted to other water molecules. Also oil molecules are attracted to other oil molecules. But since we are putting the oil on top of the water the two molecules don't attract to each other. 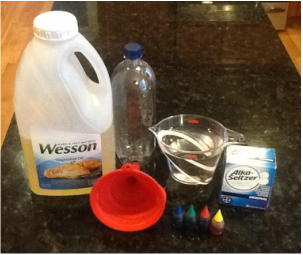 The science behind our project is that oil has lower density than water and food coloring is only soluble in the water. Alka Seltzer (sodium bicarbonate) reacts with water to create sodium citrate and CO2 gas which rises through oil. As the gas bubbles rise they take some colored water with them creating a "lava lamp" effect. In conclusion our hypothesis was correct because when we dropped the alka seltzer tablet into the mixture of vegetable oil, water and food coloring it acted like a lava lamp without the light. Juliana is in 5th grade and loves to dance and do gymnastics. Her favorite food is sushi and her favorite subjects are math and writing. She is very excited to be apart of hands on science night 2016. Aleksiana is a Yankees fan who loves to play basketball and write stories. She has two sisters and one brother. She loves kittens and puppies and her favorite color is blue. Hanging out with her friends is what she loves to do most. Alexis loves playing soccer and basketball. She loves kittens writing & drawing and her favorite color is blue. She loves all the season because they all have their own purpose. She is kind, loving and friendly.